Less than a century ago, two brothers (Lloyd and Wilber Wright) developed flight by observing birds. Today, we are flying many times the speed of sound and beyond our solar system. Nature is full of wisdom, order, and intelligent design. Humans have the ability to observe and understand nature by using the technology and knowledge that has been accumulated through the centuries. Automobiles account for about one fourth of our non renewable natural resource consumption. Most people are not aware that one fourth is also being spent in personal housing. We live the way we do because we can, not because we should. Reality is like “the Great White Shark”, and our actions will dictate how we are dealt with. The conformity and complacency in promoting the “as many square feet as you can get to develop your equity game” is rapidly coming to a close. It is time for us to change or suffer the consequences. In nature there are few linear and right-angled shapes and none that are being applied in the design of wild animal habitats. On the other hand, humans have based the design of their living and working habitats almost exclusively in linear right angle shapes. Think about it. How many linear or right angled parts are in a car or airplane, that gives us the ability to travel effectively on and over the earth? For that matter, how many are there in your body, or the body of any animals that inhabit this round planet? So, why do we live in these large, thin walled boxes made of combustible material? If I could answer this question, I could also probably tell you why we stare into boxes an average of 4.5 hours a day. Living in this manner is not only expensive, inefficient and wasteful; it is also dangerous (you’re playing the odds)! Each year there are over 388,500 home fires that result in over 3,145 deaths, 13,650 injuries, and $6 billion in property damage (N.F.P.A. 2003). There would be no need for fire insurance if your home can’t burn! The good news is that nature has provided a clear and wonderful example of efficient living in the “African White Burrowing Ant” that inhabits the arid African desert plains. 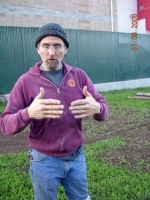 To survive, it must provide a mild and consistent below-ground climate with a movement of moisture rich air for its simbiote “microtones fungus”. This species of fungus (mushroom) digests cellulose and becomes the food source for the ant. The movement of air upward from cool to warm (convection) is not feasible below the earth’s surface. The White Ant overcomes this by elevating the earth, using its mucus to bind the particles into a dense pillar, riddled with an extensive network of air ducts leading to the top of the mound. These channels draw air from the low-north, shady side of the mound, upward. The thick walls of the mound hold coolness from the night and draw cool air with increasing velocity as the sun begins to heat the walls of the mound. Similar conditions can be created by man with stabilized earth, incorporating thick walls (18”- 30”) in modestly sized (20’) wide, egg shaped high ceiling domes. The egg shape not only provides optimum elevation, it is the strongest structure found in nature. Natural lighting can also be acquired by mounting a large (4’) sky light at the top and a few small, efficient windows along the sides. Living space can be creatively maximized by incorporating furniture, storage, refrigerator, stove etc. into the walls. An additional second floor area can also be created by working wooden beams and slotted wooden panel overlayment (at the 8 foot level) that would not interfere with the flow of light and air, and would provide maximum head room. 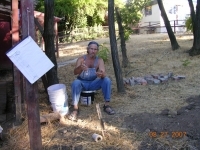 Super Adobe Coils (earth bags) are at this time the most effective method for elevating earth. As a child, you may have built coil pots by rolling clay into pencil shapes, fashioning them into a bowl by pinching them together. “Super Adobe Coils” are tubes that sand bags are made from. 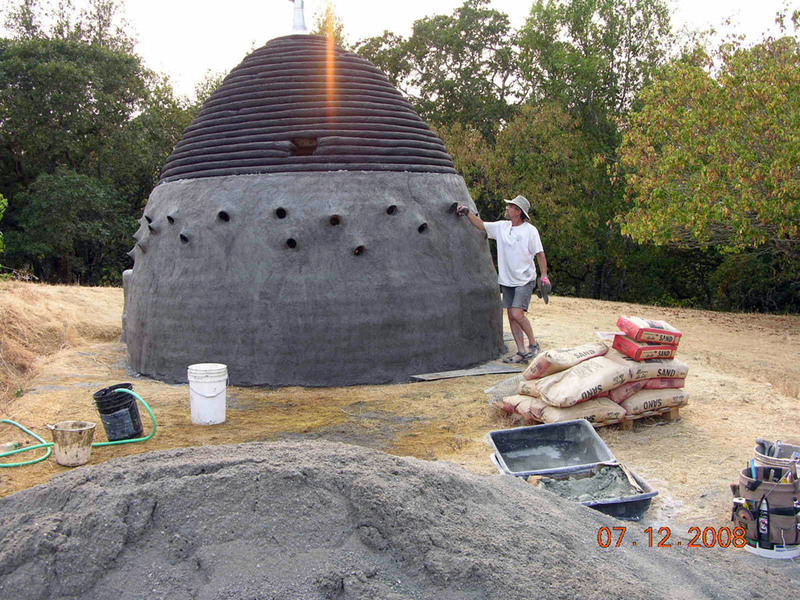 An inverted pot (dome) is constructed by filling the tubes with stabilized earth (10 parts earth, 1 part Portland cement, 1-2 parts water) and tamping it down over the preceding coil with barbed wire between the tubes to maintain tension and structural integrity. No elaborate equipment or machinery is necessary, but a cement mixer can prove quite helpful. 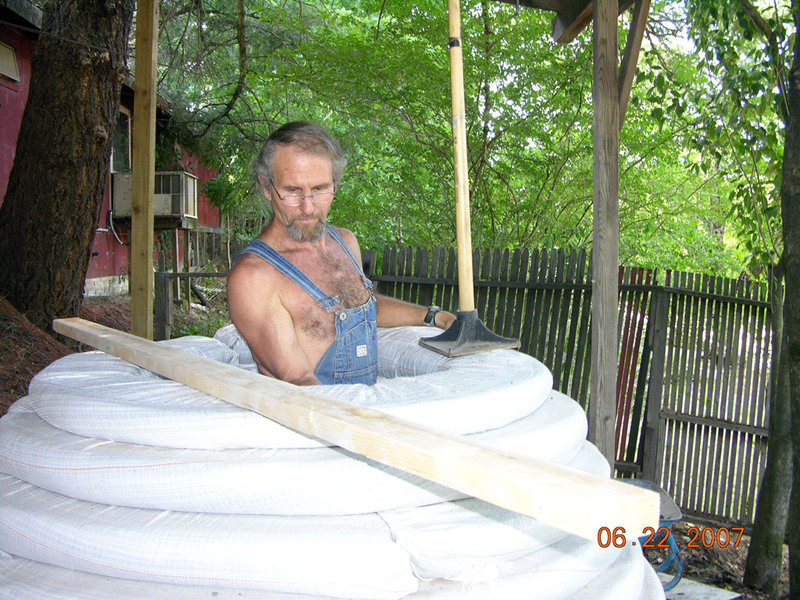 The basic shell with windows, skylight, vapor barrier and utility pop ups costs around $6,000.00 in materials and can be raised in about 10-14 days with a builder and crew of 5 laborers. Size is often a concern because we are so accustomed to living in large spaces. Living small and super-efficient is contrary to our accustomed way of living. 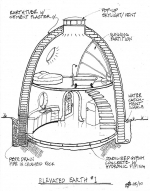 Be it for more space or privacy, a larger dome is not the answer. 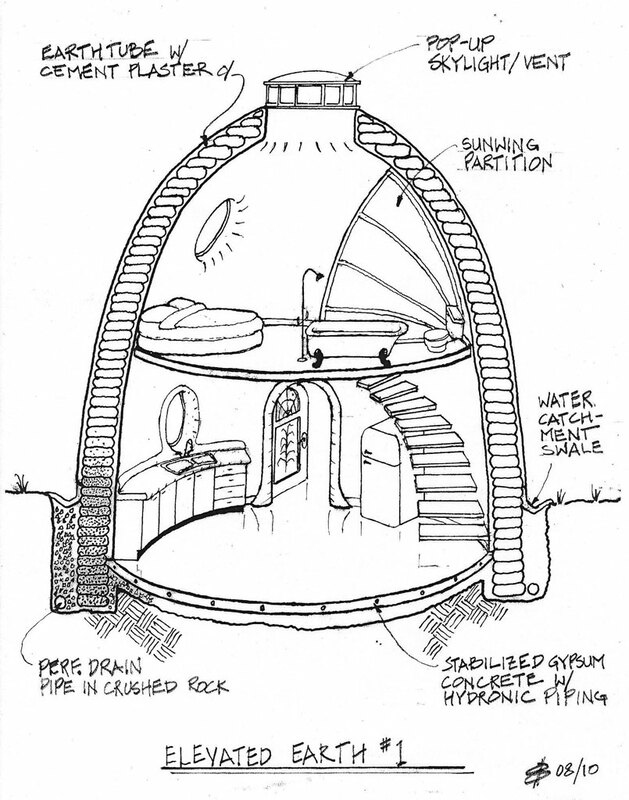 Home complexes can be made modular by connecting domes and atriums or green houses. These buffer against harsher weather, provide large areas for growing crops of fruit and vegetables, while gathering rain water. Sanity, answers to an imbalanced world; the thick walled dome may be shut down if there are radiological or biological issues. Oxygen can also be vented in from the atrium area. Impermeable to noise, bullets (50 caliber+), the shape and density of the dome will even repel small mortar rounds, and the structure surpasses zone 4 earthquake requirements in light years! All of these factors should be considered when building a home that will withstand the uncertain conditions of the next decade or more. The small size (app. 600 sq. ft.) and super-efficient design fully lends itself to an inexpensive and minimal off grid solar wind inversion (4K or less) system, which could eliminate one fourth of our cumulative energy consumption if adopted by everyone. No one would need to be “ON THE GRID”…! There are people capable of understanding that we need to change, and there are few willing to make those necessary changes. If there are any who are willing to make the changes and live the example, others will be encouraged and inspired to do the same. This is my hope and prayer for the future. Watch a virtual tour through the Domehouse construction. 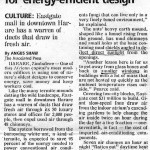 This Article “Zimbabwe Mall copies anthill for energy efficient design” (JPG, 560kb) is an example of how nature has demonstrated ingenuity and efficiency. 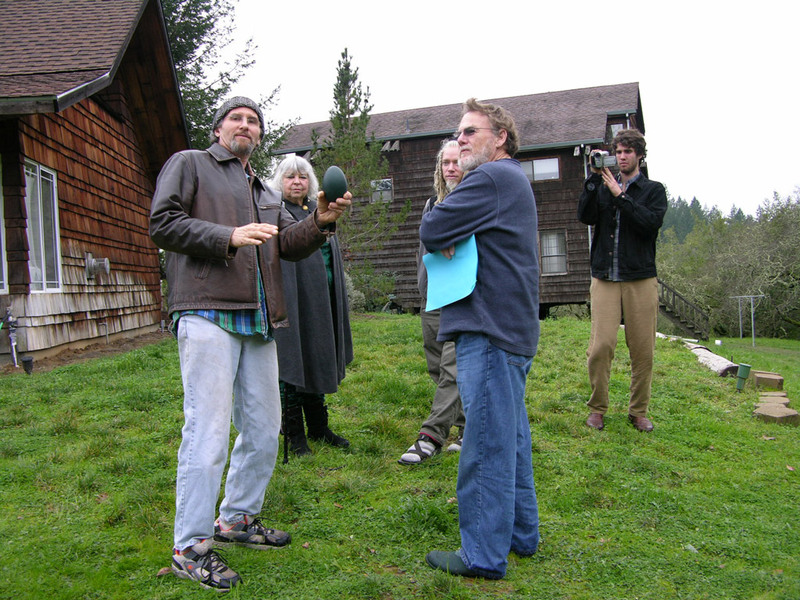 Architect Mike Pearce opens a door for us into thewisdom expressed through nature that is being embraced by man, through action, on a very large scale. hey there and thank you for your info ? I’ve certainly picked up something new from proper here. I did however experience some technical issues the usage of this website, since I experienced to reload the site a lot of times previous to I may just get it to load properly. I have been thinking about if your web host is OK? Not that I am complaining, but slow loading cases instances will sometimes affect your placement in google and could damage your quality rating if ads and marketing with Adwords. Well I’m including this RSS to my email and can look out for a lot more of your respective intriguing content. Make sure you replace this once more very soon.. I love the dome house and the creativity with bamboo. I will share this with my friends and hope to own one dome house in my village. There’s abundance of bamboo trees in my village and would like to see how well we can properly utilize them for the benefit of the people. Absolutely the way to go…GO GREEN!!!!! I am from Rwanda/East Africa, like the dome but lack skills to construct it. I don’t know how this dream of owning one will come true. Thank you for your feedback. If we have big dreams, sometimes it comes true faster than expected, the universe will open up the oppoertunities. I hope it will come to you!